If you are a businessman, managing business contacts could be your biggest headache. You may need to carry a bunch of business cards everywhere you go. It would take a chunk amount of time if you try to transfer them all to your mobile device. I faced a similar problem a couple of months ago, but I managed to find a solution. Let me share it with you. WorldCard HD is an exclusive business card reading app for iPads and I think, it is the one and only app that could serve this purpose on the iPad. This app uses the advanced version of OCR (Optical Character Recognition) technology to recognize the information from the images. After recognizing, WorldCard HD stores it in a standard table with attributes such as name, address, company name and others. To make this entire process a bit more easy, WorldCard HD offers batch card scanning. Therefore, users can scan and recognize a large number of cards in a quick time. They can also create groups to organize contacts and the iCloud and Dropbox integration makes it easy for data exchange and backup. As WorldCard HD recognizes the characters without any errors, there is no need to type manually. So there is no chance for typos in your contacts. Apart from English, WorldCard HD can also recognize languages such as Chinese, Dutch, French and German. I should also mention a small downside of this app. As the camera of iPad 2 is not good enough to produce hi-res images, users can’t utilize it for WorldCard HD. 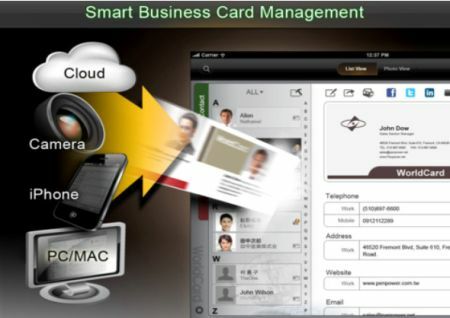 Therefore, they need to add images from their iPhone Photo Stream or import the WorldCard data from iCloud. However, you can certainly try this app, if you are busy in business. WorldCard HD is an iPad only app that requires iOS 4.2 or later. It costs on the higher side at US $14.99.